Sometimes, a need of a patient may arise to use a folding commode. Western toilets are much easier on the knees, and doesn’t require the strength to squat over the toilet. However, Western toilets aren’t always available. 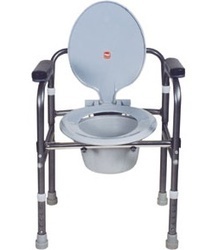 The INVALID Folding Commode helps to modify a toilet to help someone unable to use a traditional toilet. Established in 2016, We, “OR SURGICALS”, are well appreciated Wholesaler Trader and Exporter of Dental Instruments, Surgical Instruments, ENT Instruments and many more. OR SURGICALS has a very strong Organizational strength to process and deliver the Customer Orders as per committed delivery schedule. At OR SURGICALS, we understand the customer needs and requirements and provide them unparalleled customized solutions. Our ultimate goal is to improve patient care services. Customer service satisfaction is guaranteed at OR SURGICALS.